What Day Of The Week Is October 21? 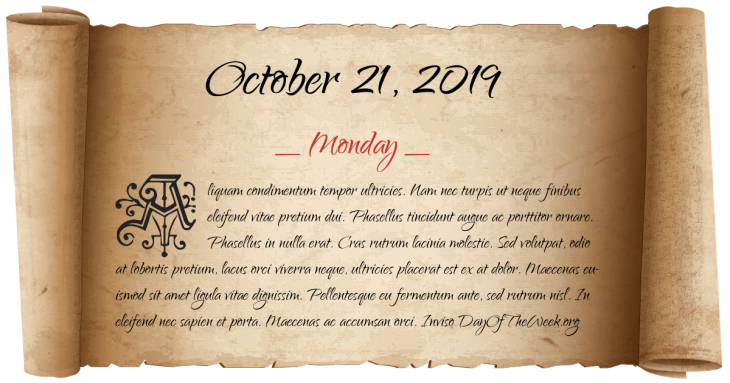 October 21, 2019 is the 294th day of the year 2019 in the Gregorian calendar. There are 71 days remaining until the end of the year. The day of the week is Monday. Napoleonic Wars: Battle of Trafalgar: A British fleet led by Vice Admiral Lord Nelson defeats a combined French and Spanish fleet off the coast of Spain under Admiral Villeneuve. It signals almost the end of French maritime power and leaves Britain’s navy unchallenged until the 20th century. President Warren G. Harding delivers the first speech by a sitting President against lynching in the deep south. President Dwight D. Eisenhower signs an executive order transferring Wernher von Braun and other German scientists from the United States Army to NASA. Who were born on October 21?